SanDisk this week introduced the 400GB Ultra microSDXC UHS-I card, which is not only the world's highest capacity microSD card but one from which smartphones, tablets or laptops can run applications. According to SanDisk, the micro SDcard achieves UHS Speed Class 1 – the best performance available for a microSD card and one that enables the speedy loading and running of apps. "What this means for users is that, in theory, they will no longer be limited to only having apps on the main memory in the device," said Jack Gold, principal analyst with J. Gold Associates. "Many users fill up that memory and now they have an option, if the device supports it, to greatly expand the amount of apps they can use on the device. This is pretty much equivalent to putting a USB drive on your computer and running apps from that." The new Ultra microSD card can hold up to 40 hours of full HD video and features data transfer speeds of up to 100MBps. At 100MBps, SanDisk's new microSD card can also move up to 1,200 photos per minute. "The fact is, most flash memory is pretty slow and the performance necessary to save a picture (think of the delays you see when your camera saves a picture to the older versions of flash cards) just doesn't cut it with apps that need ... fast random access to memory," Gold said. "That's what this is all about. Upping the game in devices that can feature faster buses, and then producing flash memory that is fast enough to take advantage of that." It also means the flash will be more expensive, at least initially, Gold said. The faster memory is more expensive to produce than older devices that are mass produced in droves. Mobile device users worldwide will install more than 150 billion applications alone this year, which require a ton of memory on all of our devices, according to Jeff Janukowicz, research vice president at IDC. The issue with SD in the past has been that while it was acceptable for storage of video and audio (and other types) of files, it really wasn't fast enough to give users who want to run apps directly from the card the performance necessary to make it an acceptable solution, according to Gold. Last year, the SD Association introduced a new "App Performance Class" of SD memory cards aimed at enabling mobile devices to run applications directly from an expansion slot. The SD Association's App Performance Class (also known as A1) specification was the first and most basic, enabling SD memory cards displaying the "A1 symbol" to meet, or exceed, 1,500 random read input-output operations per second (IOPS), 500 write IOPS and sustained sequential performance of at least 10MBps. The performance levels were considered by mobile device manufactures to be the minimum levels needed for running applications acceptably. The requirements came from Google's release of Android Marshmallow in 2015, which added support for applications run from an SD card. The App Performance Class "A1" symbol provides product manufacturers with a way to communicate app-running requirements before users buy an SD memory card. "Think about your disk drive in your computer slowed down by a factor of 5 or 10 times and think what that will do to the application experience you have on your machine," Gold said. "So the new app class sets some minimum speed requirements for reads and writes that get the newer class memory devices to the speed needed to achieve reasonable app read/write response for users. "Of course, this does require that you have a device that has the necessary speed on the SD reader bus to utilize this – and older and/or lower cost devices probably won't," Gold added. 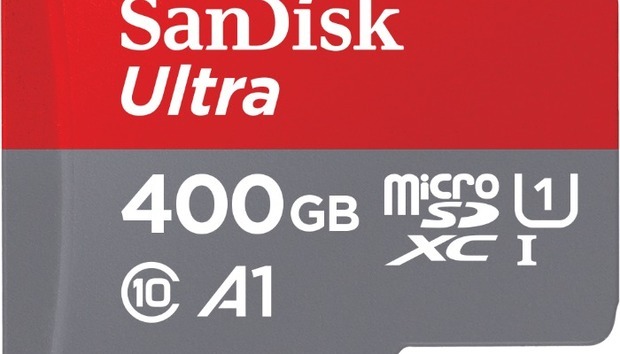 SanDisk's 400GB Ultra microSDXC UHS-I card features a 10-year limited warranty and will be available at SanDisk.com and other major retailers at a retail price of $250. The card also comes in 16GB through 256GB capacities. News Roundup: Hey Google, are you rigging the news against the right-wing press? What does ethical and transparent data use look like?